General comments: The first curry night trip of 2010 took us to Khan Ba Ba, a fairly new curry house opened next door to Akbar's to presumably try to take advantage of that restaurant's popularity. Unfortunately, that does not quite appear to be the case just yet, although there is nothing to fault on the service or décor. The food got mostly good reviews from our keen-eyed reviews. It's one of spaceman's favourites in Manchester as it's usually possible to get a table, the food and service are always good and it offers some slightly different dishes. It took us almost five years to return, such are the number of curry houses we must visit these days. However, it seems that the restaurant closed in 2016 - see here. 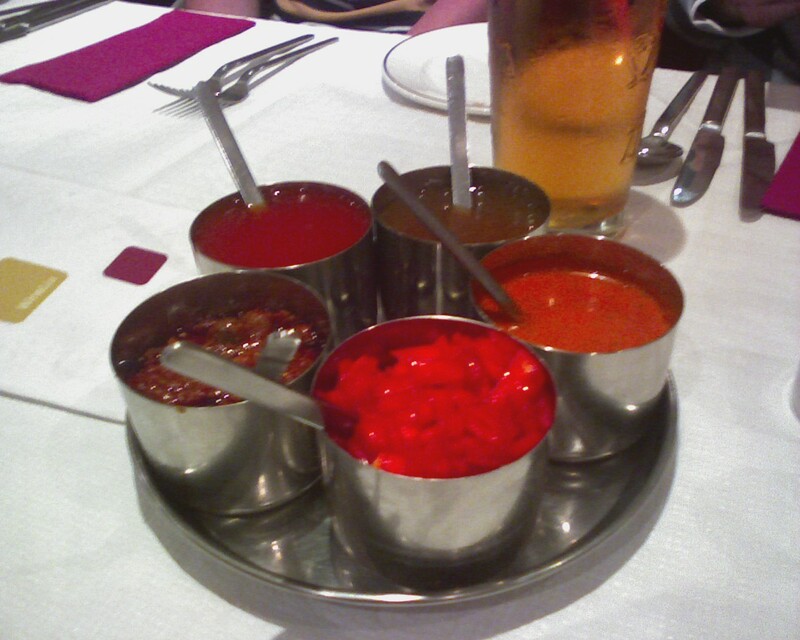 "Poppadoms were tasty and the sauces good, particularly whatever the salsa looking one was… that was a bit different. My mixed vegetarian starter was conceptually brilliant (a little bit of all the veggie starters) but ended up being a bit disappointing. The paneer tikka type part of it was great, I enjoyed that, but the rest of it was too spicy for me to taste it much. Main of dhal tarka (like normal dhal but ‘otter, ba-doom-bah) was unfortunately a little disappointing too, but this may have been my own poor menu choice. Trying to avoid having my classic saag paneer (and flapping as I was still reading the menu) I opted for this dish which I’ve only had once before (for the interested reader that was as a side in Spice Lounge and it was very nice). Although it tasted nice enough, I found it to be a bit too soupy and not enough texture, didn’t really hold my interest. So my meal all in all wasn’t a huge success, but at £20 (thank you Tastecard [which we used a few of to get some money off]) I’m pretty sure it was the cheapest curry night I’ve been to. Unusually for a curry night service was pretty fast (in fact I’d not looked at the menu by the time I was asked for my order) to the point we finished so early there was a mass movement to the pub (hoorah!) which has been lacking in most curry nights of the last few years (though the final pint was probably superfluous [never!]). Despite the generally disappointing ‘curry’ part of curry night it was more than rescued by the ‘night’ part which was – as ever – thoroughly enjoyable." "Britons Protection excellent but probably equally happy with alternatives such as Rain Bar. I'm not exactly a curry expert but have been to better places that Khan Ba Ba (but liked the Tastecard eligibility a lot!). [OK, short and sweet, but still appreciated.]" "Thanks for organising an excellent 80th curry night [it was indeed the 80th!]. I enjoyed this one, slightly smaller attendance but that in no way affected the level of fun experienced. Britons Protection is always a nice place to start an evening, particularly when the sun is out. A short walk to Khan Ba Ba and we were seated straightaway, poppadoms were brought without so much as a hint (not one I heard anyway), and then the waiter impressed us all with his novel yet simple way of handing out mega Cobras. They were quite quick about getting the orders down; this caused a bit of panic at the time but that's got to be better than waiting 30 minutes for the waiter to reappear. The staff were also very good at reining in my over-ordering of bread products, which was appreciated. I had the onion bhajis and then a chicken karahi (a regular but dependable choice on my part) and both were delicious. Only criticism I have is that the garlic naan was a bit doughy, which was strange as the plain was fine. I didn't try the peshwari, because yuck. Unfortunately I had to rush off in the middle of the after dinner conversation and post-curry drinks at Cask, but it was another storming curry night." "I was going to do a review [but is too busy so this is a paraphrased summary of a conversation]. Basically I thought that it wasn't much cop. My main was ok, but I've had better. The starter was ok but the batter to prawn ratio was not right [too much batter, one suspects]. And they served garlic naan that looked like it would be more comfortable in an Italian restaurant [a running theme, as we shall see], and I hate that!" "Nice social layout - low benchy tables, and contrary to popular/drunken belief they DO serve poppadoms (although they do charge), and not only that they reload your sauces [at spaceman's request - the dishes weren't that large and spaceman does like a bit of onion chutney], and bring more poppadoms (for more money, of course). Draft Cobra, always a pleasure. My starter [you said main, but I think you meant starter] was a kebab with a funny name that contained cheese, which was something different, and tasted nice, if unconventional. My main was a variation on lamb tikka. Again, very nice but not life-changing [gone are the days of life-changing curries, although see Quincy's entry]. My only real issue was that the lamb bits were absolute boulders, which may have given the dish a bit of a psychological edge on me. Decent quality meat, and very eatable sauce, which was slightly stymied by the toast-style garlic naans. To be fair, I should have switched to regular naan, but to be even fairer I shouldn't have to, dammit. So again, Khan Ba Ba does the food well, but while one sundry issue was fixed (the possibly fictional lack of poppadums), there was still another biggy to deal with (naan bread should not be Pizza Hut garlic bread). I would definitely return, though, partly motivated by the opportunity to sample the wide range of esoteric menu choices [spaceman agrees] - somewhere to go when you don't just want another chicken bhuna. Hard to say where it stands in the increasingly crowded league table of city centre curry venues, due to its unconventional charms." "Cask beforehand and afterwards was good (swift Cruzcampo before, some kind of whea t beer afterwards). Khan Ba Ba was pleasant enough, and contrary to popular belief (i.e. me, Brungerio and spaceman [who had been previously]) it does do poppadoms [we'd been out with JNo - we were drunk]. It also does Cobra, which is nice. On the other hand, the curry I had was a medium lamb-in-gravy type affair, which damn near killed me. Genuinely think I've become allergic to chilli in my old age [Quincy specifically requested a swing-door mechanism to be installed at the gents as he was there that often on the subsequent Friday - spaceman has since advised of the specific benefits of Imodium]. As a result, I have decided to give up curries entirely (at least of the Indian variety - Thai and Japanese, to be confirmed). Look forward to future reviews of cobra, chicken nuggets and chips, or cobra, steak and chips. Maybe a korma if I'm feeling adventurous [you only had a medium, for chrissakes!]. Also, the email spell-checker throws up "pompadours" as an alternative to "poppadoms". This is brilliant. [Don't change the subject.]"